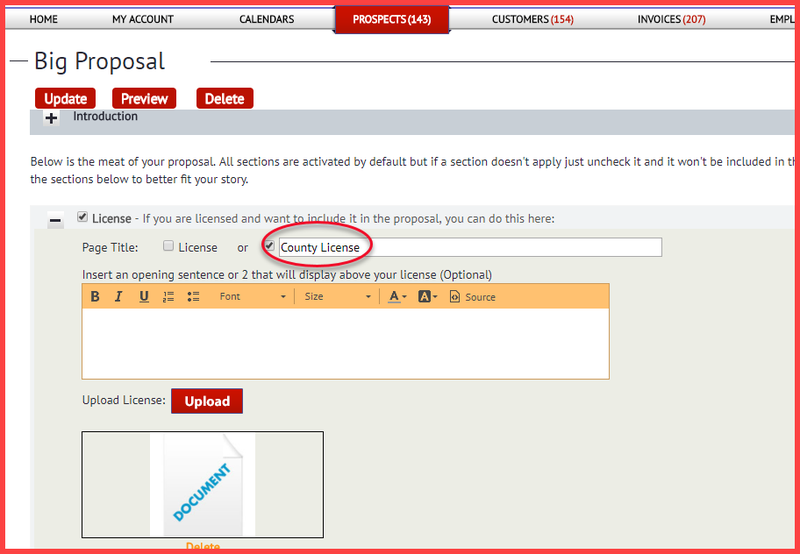 We recently created a new feature in The Customer Factor called “Big Proposal”. It’s really becoming a user favorite. If you’re not using it to send interested prospects and customers a proposal/estimate, we highly encourage you to do so. At its very core the Big Proposal allows you to tell a better story about your services and your company. It’s an attractive multi-page proposal that your prospect and customer can read just like a book with various navigation links and pages they can click on. Then they click “accept” and you’ll get an email automatically letting you know they accepted and you can contact ’em and close the deal. Think your competitors are presenting quality estimates and proposals to their prospects and customers? Probably not. So let’s talk about creating a Big Proposal. First, visit the Big Proposal screen. We have 5 different formats and 10 different colors to choose from. If you want to get an idea what a Big Proposal looks like before you even create one, click on any of the format links (Format 1, Format 2, Format 3, Format 4, or Format 5) to open a window for that respective format. Pretty cool, huh? Ok…so next, i wanted to add that you can create an unlimited number of Big Proposals. 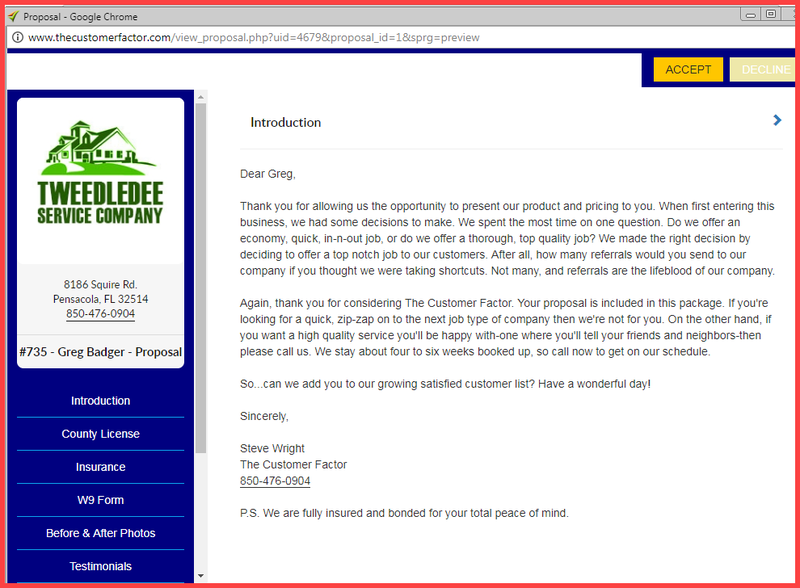 Maybe you want to create one for residential prospects/customers and a different one for commercial prospects/customers. Or maybe you want to create one for prospects/customers expressing interest in window cleaning and another one for prospects/customers expressing interest in pressure cleaning. So you can upload before/after window cleaning photos for the window cleaning Big Proposal and for the pressure cleaning Big Proposal you can upload before/after photos of some pressure cleaning jobs. So…to continue on, let’s put in a title. We’ll just call it “Big Proposal” and we want to create it for prospects and customers. Then go down the page and open pages and upload whatever applies. So if you want to upload your insurance certificate, open up the Insurance page, click Upload, and upload a pdf doc of your insurance. You can upload license, insurance, w9 form, and an agreement. And you can include testimonials, additional services, and before/after photos. So any page name can be changed. For the introduction and closing areas, you’re more than welcome to make changes but we do have sample text already in these areas. At this point you’re probably saying “Ok….this is great but now what do i do? How do i actually send it?” Great question! Since this article is getting a bit long, check out this article on how to send a Big Proposal.